Most people would agree that a reporter or a journalist should not show any bias towards a story or an event they are covering. Well guys good thing I am not your average reporter or journalist! Langley Speedway has been my home away from home for over 10 years now. I remember when my father took me to my first race back in 2003, needless to say it was love at first sight for me! Well everyone, it is that time of year again when the car covers come off, the rumble of engines and the sweet smell of cam2 floating through the air! Langley is set to drop the green flag on its 64th season come Saturday April 5th and I know I can’t be the only one excited to get this season of racing in Hampton Roads “officially” underway. This Saturday is like a January 1st for these drivers, a clean slate, a clean chalk board to leave their mark on a fresh season. This is a new year, with plenty of new possibilities for every driver in every division. Hopefully events that happened last year are pushed to the side as new cars are built, drivers tackle new divisions and new drivers are introduced to the track. You know I am going to get a little sidetrack here, but I want you to give me a chance and hear me out. For those who are familiar with my family and my mother there was pretty much only one true rule you had to follow to keep her happy; No phone calls or visits to the house Monday through Friday between the hours of 3 & 4 PM EST. For those who do not know, this was the time slot for her only soap opera General Hospital. 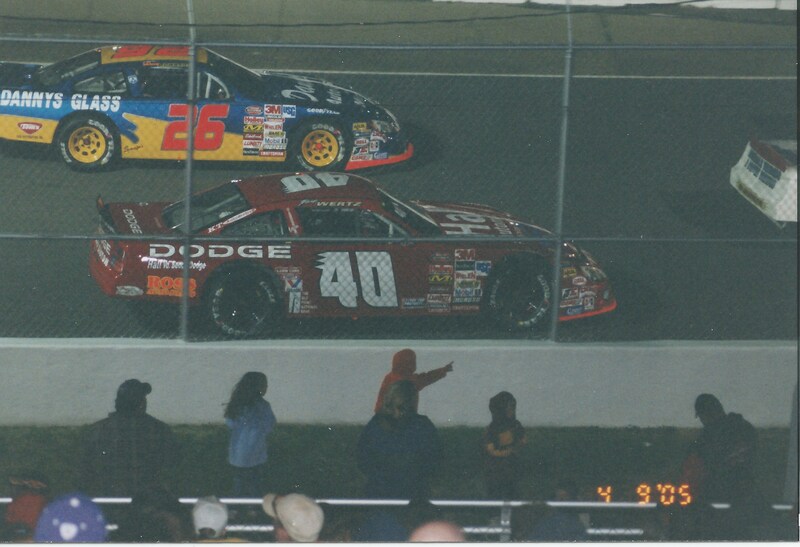 Edwards, Jr. & Mark Wertz set to take the green flag back in 2005. Langley Speedway is like that for me, and I am willing to bet it is like that for a lot of racing enthusiast in the pits and the grandstands a like! Langley is like that novel you pick up but you can’t put down because you are so wrapped up in it and you have no idea what is going to happen on the next page; does C. E. capture another W or does Matt Waltz run him down like a man possessed, whats the next round in the Humblet-Balluzzo bout going to look like, who’s going to push who to victory in the karts. See Langley is not just a racetrack, to many it is their get away, their cloud nine, to some Langley is their breakthrough! 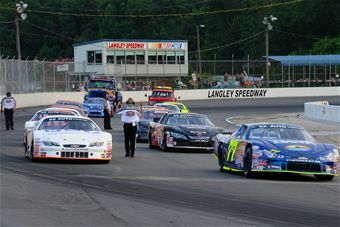 This year Langley Speedway welcomes back 11 divisions of racing this summer, a full list of divisions, rules, schedules and drivers can be found at their website, click the link for more details Langley Speedway. By the way, in honor of celebrating Langley Speedway’s 64th year running, please enjoy these photos from 2005 that I have found digging around! 2014 without a doubt promises to bring some of the most exciting racing that this short track as ever seen! Four time Late Model Stock Champion C. E. Falk better bring his A game to the track this year because he will have plenty of drivers looking to knock him off the top spot! Matt Waltz, driver of the #2 Waltz Engineering machine is a prime candidate to accomplish this. With an incredible run at Martinsville and capturing 3 wins at Langley Speedway as gotten Waltz and the entire crew ready for a strong show out in 2014. Some others to watch for are long time Langley driver “Quick” Nick Smith, who saw his fair share of Dale Lemonds Victory Lane in 2013. Nick ended up 2nd in points just 46 points out of the lead. I would also encourage you to keep an eye on Sophomore driver Brenden Queen as he is set out to win a Youth National Championship this year. Also do not forget new comer to Langley this year, driver of the #15 Atkinson Racing machine of Brandon Atkinson. Spending 2013 away from the race track did not seem to take away from this boys talent as he was running only .800 off the pace running on tires that were two years old. 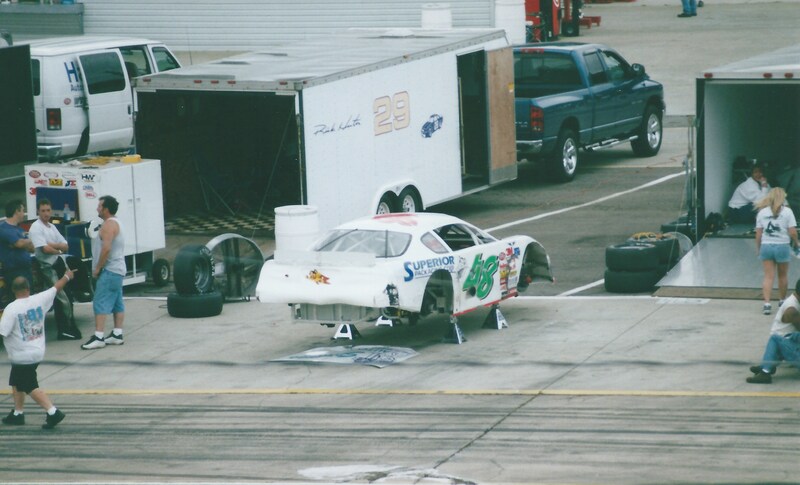 Balluzzo’s Late Model patiently waiting her turn on the track in 2005. What you should pay attention to is the well-known rivalry between Modified drivers Jimmy Humblet and 6 time Modified division Champion Shawn Balluzzo. 2013 was a difficult time in Shawn’s racing career to say the least, struggling to find victory lane, then finding out he needed to have a heart procedure done mid-season. As hard as it is for any racer Balluzzo did the right thing, took care of his health. Balluzzo came back to the division after being medically cleared only to have his car totaled in a brutal crash on the front stretch. Yet another bump in the road to seven Balluzzo never gave up. Balluzzo with the help of Boccy Creech built a brand new car from the bottom up in a little under three weeks. If I were you I would keep my eyes on the Balluzzo team as they are all hungry for title number 7. Other drivers to watch for this season, Kevin Morgan making the move out of the UCAR division into the Grandstock division. Fellow UCAR driver John Largena will make the giant leap out of his #88 “four banger” into the #4 Modified this year has he looks to bring home rookie of the year honors. Maddy Mulligan, your 2013 Bandolero Track Champion has also moved up into the Pro6 division, could a bigger car become a bigger challenge for this 15-year-old young lady, make sure to check her out April 12th for her first race and follow her on Facebook, Maddy Ryan Racing. 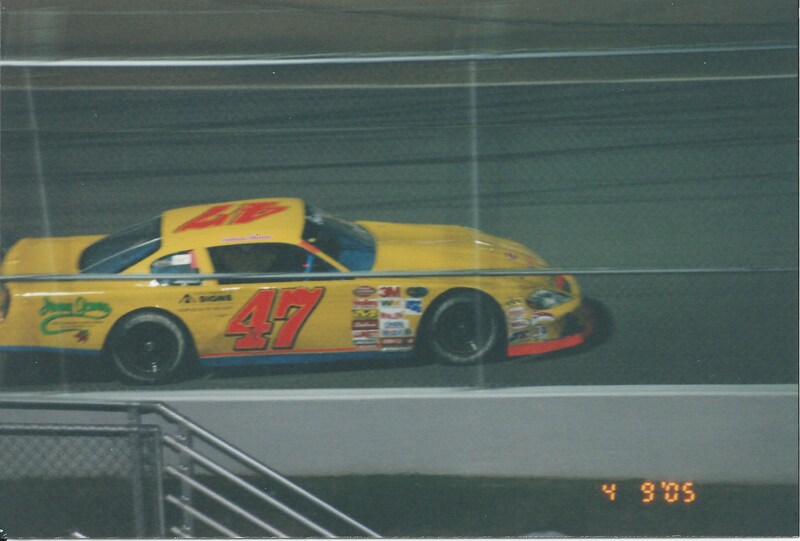 Anthony Warren and the #47 machine runs at Langley Speedway in 2005. Again those in the front office have worked hard in getting the fans a lineup of touring series to come visit historic walls of Langley Speedway. Not only will the popular Nascar Southern Modified Tour return to Langley Speedway this year, we now have two dates on the schedule. The series will visit early (April 12) and late (August 30) this year as these high power machines will promise to proved 14 second lap times around the flat track beauty that is Langley Speedway. The K&N Series is set to take a trip through town Saturday June 21st as these young men and woman look to gain experience under cars that resemble the older style Busch/Nationwide cars. I personally hope to see drivers like Daniel Suarez, Kenzie Ruston and finally Lee Pulliam take to Langley Speedway to battle to victory. Don’t believe this series has an impact on a drivers career, Lets just ask last years winner of the K&N East event and eventual series champion Dylan Kwasniewski who now has a Nationwide ride. 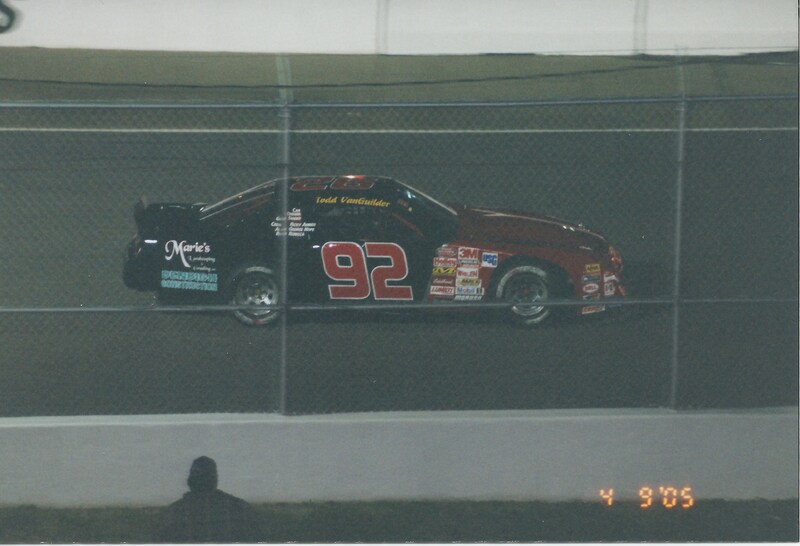 Todd Vanguilder and his #92 LMSC under parade laps back in 2005. If there is one thing you can take from this article, let it be the passion that I have for this track. Many of nights I spent finally being able to hang out with my dad after a busy week of him running his company, so many new friends and family I have gained at this facility, the times I spent with my girlfriend (now my wife and best friend) pointing out who is who, what to look for! I have spent all of my time on what some people will say is the wrong side of the fence but for me, any side of the fence is the right side. Help me this saturday in kicking off what is going to be another great season at this amazing track, bellow you can find a little bit of information on times and pricing for this weekend. Cant wait to see you at the track! For more information about times and ticket price please visit the tracks website, www.langley-speedway.com OR call the speedway (757)865- RACE (7223). No need to worry about CE. He moved to Concord NC to work on Sprint Car team.